We’re a community of people of all ages and from all walks of life. We don’t come to church because we’re perfect people, but because we want to grow in our faith, we want to worship, we want to serve, and we want to share God’s love with our community in practical ways. We’re active partners in Churches Together in Furness and work closely with other churches in the Ulverston district. We’re a modern, outward-looking church with ancient roots. St. Mary’s has been the Parish Church of Ulverston for 900 years. 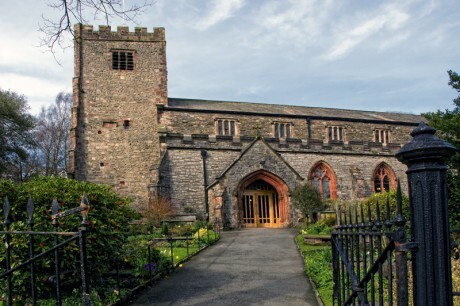 St. Mary’s has been the Parish Church of Ulverston for 900 years. Nobody knows exactly when the first church was built on this site, but most people believe that a church was founded here in 1111 AD. In the reign of Henry II (1154-89) the church in Ulverston was placed in the care of the monks from Conishead Priory. The church also paid an annual sum to Furness Abbey. During the Dissolution of the monasteries by Henry VIII, both Furness Abbey and Conishead Priory were destroyed. The church in Ulverston became the property of the crown and was restored during the next 50 years using stone taken from both Furness Abbey and Conishead Priory. The first Vicar was Leonard Fell. The Fells were an important local family and have many connections with the church. The present tower was built between 1540-60 with money left to the church by a later Leonard Fell (not the first vicar) on his death in 1542. It is said that this replaced an earlier steeple that collapsed, possibly following a storm, damaging much of the church building. Most of the church was rebuilt and restored in the 19th century. The first restoration was carried out in 1804. Further work was undertaken in 1864 and 1902. In 2008/9 the interior of the church was re-ordered to bring it up to date for modern forms of worship as well as to provide a meeting and refreshment area. UPC currently have a staff vacancy for a Youth Minister, based at the Parish Church, to lead, pioneer and grow a Network Youth Church (11-18 years old), serving Ulverston and the Furness area.